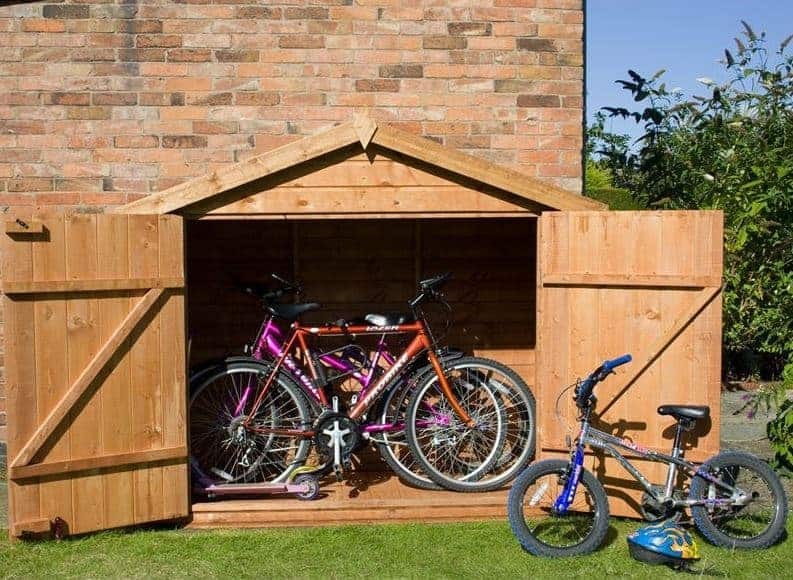 This chic, compact wooden bike shed provides an ideal place to store your family’s bicycles. Built with security and privacy in mind, this windowless unit comes fitted with a high quality pad bolt. Benefitting from a 12mm tongue and groove cladding construction, it boasts a great weatherproof design. It even comes with a sharp apex roof, ensuring any water quickly drains off the building. It comes with small double doors which open up wide to allow easy access to transfer your bicycles. You can also store small tools and equipment in here too. 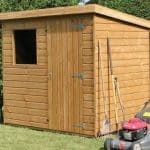 While the building does need to be treated, you do actually get a free treatment with the shed so this saves you money in maintenance for the first year. 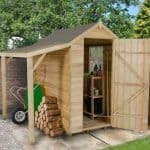 The shed benefits from much the same features as Walton’s larger garden sheds including double framed corners and a strong ledge door design. Thanks to its compact size, the bike shed is also really easy to assemble. If you’re looking for a secure, durable and affordable storage space for your bikes then this is a great choice. You also have the option to invest in a number of extras to get even more from this great value building. 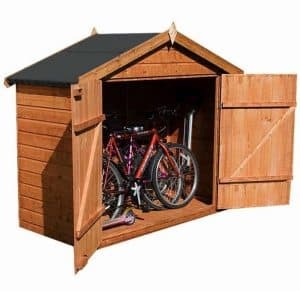 This is a small, attractive wooden bike shed that is capable of holding two adult bikes and a couple of smaller children’s bikes if needed. It’s an ideal family bike storage unit. What makes this bike shed so unique is the fact it benefits from a full apex roof, just like larger storage sheds. This is a fantastic weather-resistant feature and it is covered with exceptional quality sand felt. Water hits the roof and is directed down and away from the unit, falling straight onto the floor. It also adds more height inside the building, accommodating taller bicycles. This isn’t really a walk-in shed, though the roof does measure a fantastic 1.72m tall. The eaves also have a generous height, measuring 1.32m tall. 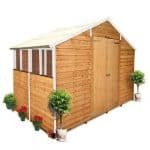 It is the compact width and depth of the building that makes it suitable for any garden. It reaches 2.01m in width and 0.82m in depth. The double doors have large impressive measurements too, reaching 1.32m tall and 1.56m wide. 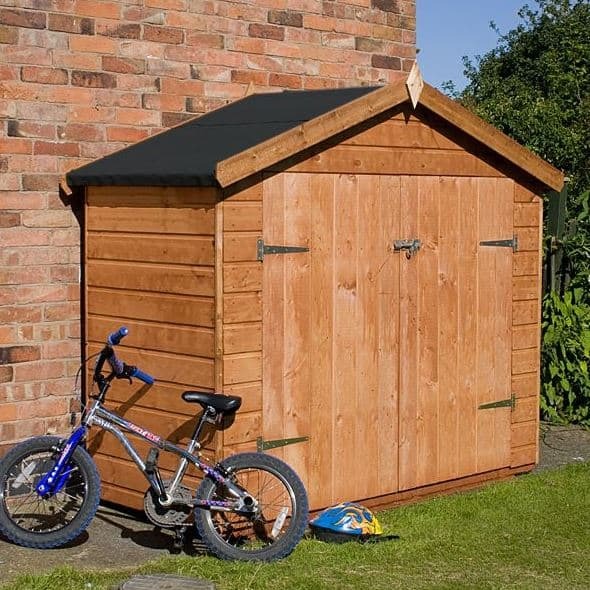 This great bike shed is built with impressively high quality Shiplap tongue and groove cladding. The 12mm thick cladding helps to give it an incredibly sturdy design. It is known as the most stylish type of cladding, as well as the strongest and it ensures excellent weather-resistant benefits. 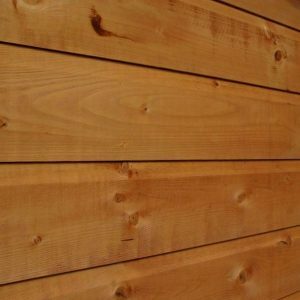 What you may not know about Shiplap is that it features a small, dented channel. This acts as a very efficient rainwater deterrent as it glides the water away from the materials, onto the floor. So not only do you have a water-resistant apex roof, but the actual timber is also designed with weatherproof protection in mind too. It also has the benefits that tongue and groove cladding provides. The main one is the expansion gap provided to support any seasonal changes that may occur in the timber. As the weather changes, both heat and moisture can cause the timber to swell and warp. 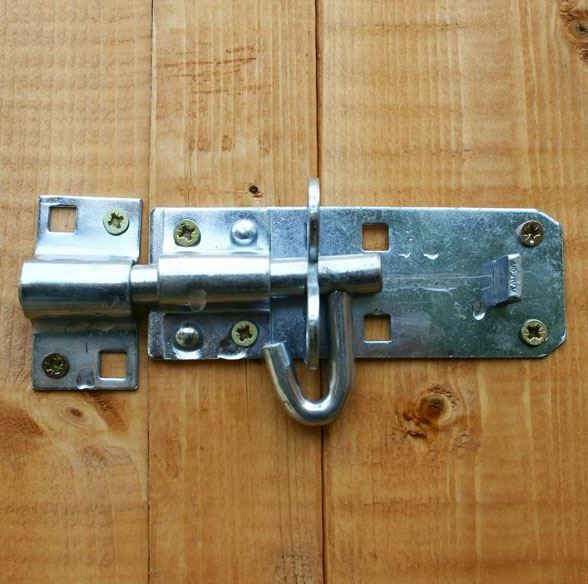 Without a gap, this can cause damage to the structure of the shed. So the fact it does contain an expansion gap is a very reassuring feature. This may be a smaller building, but Waltons have still given it a 28mm x 28mm frame. In fact, a lot of attention to detail has gone into the framing of the shed, with double framed corners and round edged framing being a prominent feature. The rounded and planed design ensures you and your family are protected against possible splinters. It also provides a more seamless design, whilst also adding moisture resistant benefits. The shed comes with an 8mm solid sheet material floor. Now usually this is something we’d be a little disappointed by. However, as it is designed to store bicycles, you should find this floor is incredibly strong. Just be aware that it will not support the weight of anything heavy so if you are planning on using it as a general storage space, you would need to upgrade the floor. A free water based Golden Brown treatment is included with this bike shed, though we would advise you invest in a spirit based treatment too. This is because although water treatments do a great job, they are only designed to protect the outer surface of the timber. Therefore they do need to be reapplied at least once a year. Spirit treatments on the other hand soak into the timber and create a protective layer both inside and out. So you get a very tough level of water-resistance. A 10 year anti-rot guarantee is included, though to benefit from this you need to apply treatments as instructed by the manufacturer. Waltons state that they use a water treatment before the shed is shipped, but this won’t cover you with the warranty. You need to apply another treatment after installation in order to kick start the 10 year guarantee. Extra wide double doors are provided which open out to almost the entire width of the building. This makes it really easy to get your bikes in and out of the shed. They also have the additional benefit of a diagonal cross beam design. Along with the ledge style, this means the doors are incredibly durable and solid. The cross beams prevent sagging that can occur over time. As the bike shed has been built with security as one of its main priorities, there are no windows supplied with the building. 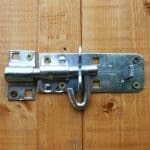 T he security of the bike shed has been given plenty of attention, with a number of great features helping to ensure your bikes are 100% safe. 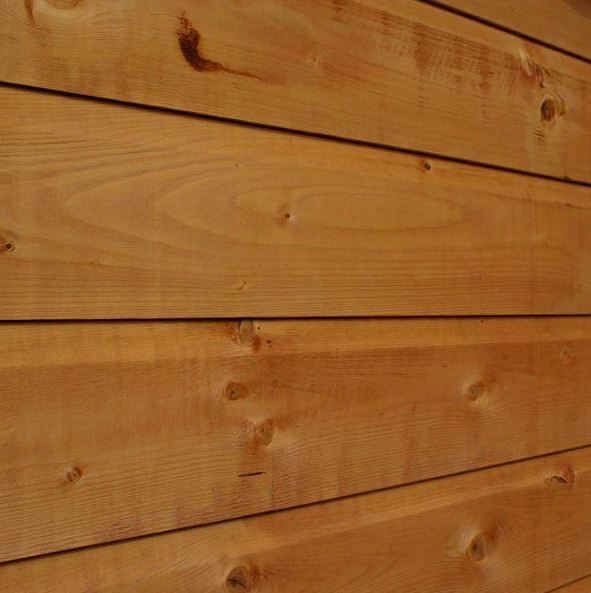 Firstly, there’s the thick, hardy Shiplap cladding which makes the shed very tough to break through. Then there’s the added pad bolt which we are particularly impressed with. It ensures that only you have access to the building. You will also be happy with the privacy supplied with the shed. No windows means there’s no chance of anybody guessing what’s inside. So you can store valuable bicycles without worrying about them being seen. We feel this bike shed doesn’t really need any extras, but there are a few notable ones available that you may find really useful. For example, the shelf sets can be ideal if you are thinking of using the building as a general storage space, rather than a bike shed. Made from 16mm tongue and groove cladding, these shelves boast incredible stability and can easily old heavy large tool boxes. They are also available in four different options, including three different lengths. The extra support pack for the floor could also be useful for general storage purposes. As we mentioned earlier, the floor should be more than strong enough to support the weight of your bicycles. However, if you are using it for general storage, the support pack will be needed if the tools and equipment you are storing are pretty heavy. Other extras that are available which you might want to consider include the 49mm weatherproof padlock, superior duty fibreglass roof felt and various treatments. However, these are more personal preference options rather than necessary extras. We like the high quality design of this bike shed. It comes with all the features you would expect to keep your bikes safe and dry all year round. Plenty of attention to detail has gone into its construction. With a 10 year anti-rot warranty, you are guaranteed this building will last at least a decade. That is of course if you treat it as directed by the manufacturer. 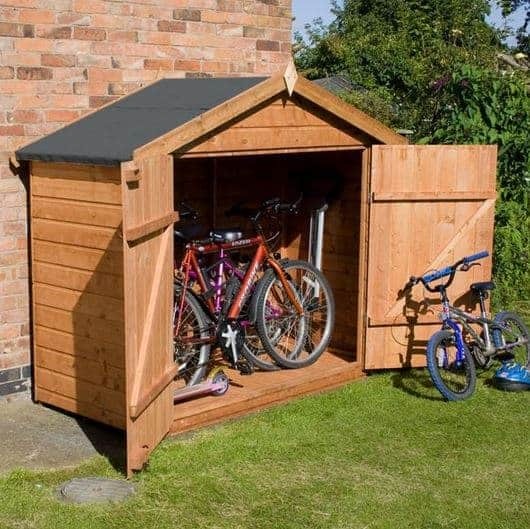 If bought as a bike shed, this compact building provides ample space to store all of your family’s bicycles. However, if using for general storage you may find it is a little on the small side. As this isn’t a large building, it doesn’t take long at all to assemble. You will also find the instructions very easy to understand and follow. So if installation is a concern, you’ll be pleasantly surprised by this building. This is one of the best value for money bike sheds we’ve had the pleasure to review. Considering its low cost and the fact you won’t need to spend a fortune on added extras makes it a very cost effective buy. Even with the annual treatments required, you are still getting amazing value for money overall. Final Thoughts: We’re really impressed by this small wooden bike shed. Waltons are known for their high quality outdoor buildings and this is definitely a great example of the quality you can expect. 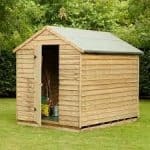 Built with 12mm Shiplap tongue and groove cladding, the shed comes with a great 10 year anti-rot guarantee. With no windows and a strong pad bolt included, you are guaranteed fantastic privacy and security. The framing of the shed is also impressive, helping to create a very sturdy building. 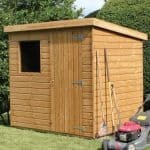 Quick and easy to assemble, you’ll soon have this shed up and ready for use. 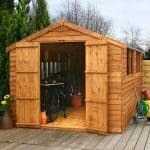 You will struggle to find a more affordable bike shed that offers such outstanding quality.